In 2008, Britain’s BBC Three channel ran a series of one hour pilots with the view to awarding one of the shows a full season. Being Human was by far the most popular of the pilots and was awarded a six-episode series shortly after airing. The quirky plot revolves around a vampire, a werewolf and a ghost sharing a flat together in Bristol, England. It sounds like a good way to start a joke but Being Human falls firmly in the horror-drama genre and it is one of the most popular series to come out of the UK in recent years. Following a shake up in the cast following the pilot, Being Human stars Russell Tovey as werewolf George, Aidan Turner as vampire Mitchell and Lenora Crichlow as ghost Annie. Season 2 opens with tensions rising high in the house as George struggles to come to terms with having killed Herrick at the end of season one while his girlfriend Nina (Sinead Keenan) makes a devastating discovery about herself. We learn of a sinister organisation CenSSA that could spell the end for all supernatural entities and beings and we realise that they have their sights on George and Mitchell. Mitchell starts to assert his independence from his housemates and for a brief moment entertains the notion of a normal relationship with a doctor at the hospital, Lucy (Lyndsey Marshal). That plan is put in to serious disarray as the local vampire community descends into chaos and mutiny and Mitchell steps up to re-establish order. Meanwhile, Annie decides to get a job at the local pub and meets Saul who seems lovely at first but we soon realise that he, too, has been touched by death. This is all just the beginning of the season but to say too much more would be to give away spoilers! So much happens in this season of Being Human that it is hard to believe that it is just eight episodes long. Benefitting from the BBC’s lack of mid-show commercial advertising, the episodes run for a full hour and each episode wraps up an entire sub-story. The result is excellent character development and a plot that is decidedly darker, more violent and infinitely more exciting than the first season. Russell Tovey, Aidan Turner and Lenora Crichlow shine as the slightly off-beat supernatural trio but there are also some impressive performances from the supporting cast. Paul Rhys and Amy Manson are fantastic as the deranged vampire couple Ivan and Daisy and Lucy Gaskell puts in a fine performance as George’s girlfriend Sam. The stars among the supporting cast are undoubtedly Donald Sumpter as religious zealot Kemp and Lyndsey Marshall as Professor Lucy Jaggat. This is the season where everything changes and by the end of it George, Mitchell and Annie realise that they can never return to the little house the shared together in Bristol. It is an explosive season (literally!) and I would have to say that I enjoyed every single sub-plot, character and storyline. It is a good thing that season three wrapped up filming in Cardiff last week because I cannot wait to see what the next season has in store. Being Human is known for fantastic special effects and vampires, werewolves and ghosts alike are presented in absolutely brilliant, sometimes startling form. The costumes are fantastic too and I loved the scenes where the characters flashed back to the sixties and earl seventies. Although many of the scenes were dark, mirroring the darkness in tone of this second season, the series is visually stunning at times and the darkness is often contrasted with bright red flashes of colour, often blood. All of this makes Being Human a perfect series for the Blu-ray format. Presented in HD 1080i video, the visual quality of this set is outstanding and it really brings the story to life in crisp, flawless and often gory detail. Being Human features a really beautiful score by composer Richard Wells and this is presented well on the Dolby Digital 2.0 stereo soundtrack. Popular music also features highly in the show, especially in the flashback scenes and I was delighted to hear The Velvet Underground and Jefferson Airplane this season as well as Bat For Lashes. The Being Human: Season Two Blu-ray set is packed full of special features and is a collector’s dream. The second season of Being Human was marketed by a strong viral campaign across the Being Human blog, Twitter and YouTube. Part of that was a series of CenSSA mockumentary clips showcasing the discoveries and research of CenSSA and these clips feature as hidden menus on the Blu-ray. I’d recommend watching the season first before watching the clips though as they do contain spoilers. CenSSA stands for The Centre for the Study of Supernatural Activity and you can also see the clips on the CenSSA website. The Blu-ray also includes several featurettes including “Blood Bursting”, “The Caves”, “Unleashing the Beast”, The Swinging Sixties”, “Behind the Makeup”, “Making the New Werewolf” and “Train Carnage”. These are certainly some of the best special features I have seen in ages and make the Blu-ray experience a must-have for fans of the show. It is not hard to see why Being Human is so popular but it really is one of the best shows on television. It is one of the few shows I would seriously take the time out to watch again and again as the dynamic and story is just that good. I would absolutely recommend the Being Human: Season Two on Blu-ray and do not hesitate to give it five out of five stars. 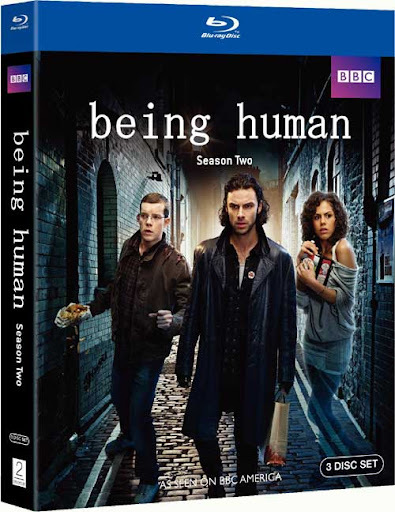 Article first published as Blu-ray review: Being Human: Season Two on Blogcritics. This review contains affiliate links. Thanks for the write up Emm. Terrific! This is one I've been meaning to check out forever! I think you've just pushed me over the fence. hmmm, I always wondered what this series was really like. I knew it was about vampires, but I can't tore my eyes away long enough from "True Blood" to notice any other series yet. LoL But I will give this a try soon, since it's pretty short and sounds hot too! Sorry guys, seems like I didn't spot these comments! @ Brent: Check it out - it is brilliant. If you can get your hands on the original pilot, check that out too. @ Kathryn: This is completely different from True Blood so I say make room for both of them! Definitely a great show I'm discovering this week-end! I'm discovering this tv series this week-end and I think that it's a good one, cleaverly using abnormal creatures to evoque drama themes.